Robbie Neilson will go toe-to-toe with a former team-mate when MK Dons take on Oldham Athletic this Saturday. 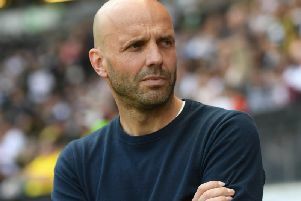 The Dons boss played alongside new Latic's manager Richie Wellens at Leicester City from 2009-11 when the Foxes were playing in the Championship. Wellens took over from John Sheridan after a torrid start to the League 1 campaign, picking up just one point from their opening six games. But now undefeated in five in all competitions, they head to Stadium MK on Saturday as one of the division's form sides, stabilised by Wellens' full-time appointment. "I know Richie really well, I played with him at Leicester," said Neilson. "I know the type of character he is, he'll be desperate to do well and he has really turned the boat around. "They've got a strong squad and some really good players, some good investment and some foreign boys in there and they'll be eager to push up the table. But we've look at it and we feel if we play our game, we should get three points." Oldham visit Stadium MK sitting 19th in the table after their pick-up in form, four points behind 14th place Dons. But Neilson is wary not to read into the Latics' league position ahead of the game. He said: "This season is really competitive. Last season, there were four or five teams who would be in and around that bottom area, but this season, it could be anyone. Plymouth are cut adrift, but playing anyone else, if you're not on your A game, you're in trouble." Dons have gotten the better of the Latics in each of their last six meetings, including a 7-0 drubbing at Stadium MK back in 2014. Last time the sides met, Nicky Maynard scored deep into injury time to secure a 1-0 win for Robbie Neilson’s side in February, having beaten them 2-0 at Boundary Park earlier in the season. Dons though are expected to be without Osman Sow for the foreseeable future after he hobbled off against Walsall on Tuesday. Neilson confirmed on Thursday: "We're really disappointed to lose him. He'll get scanned assessed later today (Thursday) but it's not looking great. Fingers cross it's not too bad. "It's a little bit frustrating because we've waited to get Chuks Aneke fit, and when he does, Os comes out. But it's part and parcel of football and we've still got really good strikers at the club. Kieran Agard was our top scorer last season and Ryan Seager has been scoring too. It's up to them to come in and fill the void."